Can't believe it's October already! My family and I are looking forward to all the Halloween traditions and activities this fun month brings, in which the Utah Valley area has no shortage of. This week my family and I are headed to Provo River's CLAS Ropes Course to start Halloween off right on a Haunted Boat Tour perfect for young and old alike. What a fun opportunity to have some Halloween fun in a unique and memorable way. This is the 18th year of the Halloween Boat River Cruise and has now become a Halloween tradition for some families. With non-motorized boats used, to keep the noise and rattle down, you are pulled along the quiet river by a rope used by the captain. Some liken the experience to the Venice canal rides. The cruise boasts a fun pirate atmosphere/theme, a spooky story told by the captain, over a hundred hand-carved Jack O Lanterns, and Halloween lights, and the climax... a PIRATE ATTACK! There is also concessions available and a free screening of Spooky Bats And Scardy Cats movie, before or after the cruise. We are so excited about our upcoming cruise adventure and will share a full family guide to our adventure on the spooky Provo next week with all the details. 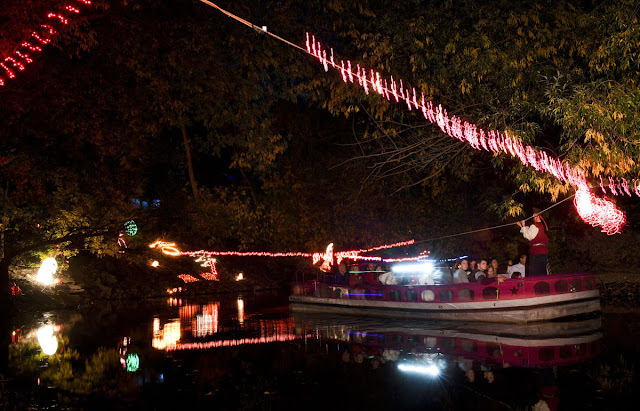 In the meantime, get a dollar off admission from CLAS Ropes Course website here and start planning your Halloween Boat Cruise.